Although the tribe Hilarini of the family Empididae is distributed worldwide, the genus Hilara Meigen is mostly Holarctic in distribution. It is the most difficult genus of the family Empididae, as it includes species of a very uniform appearance, lacking distinctive differential morphological features. The epigamic behaviour, swarming of both males and females, with mating in variously shaped small or large aerial aggregations, so characteristic of the Empididae (the dance flies), reached its peak of perfection in the genus Hilara. The prey, the "wedding present", is usually wrapped up in a silken web produced by the silk glands present on the male fore leg. The mating activity is concentrated around water biotopes, often in very characteristic swarms just above water surface. The species-specific epigamic behaviour leads to an effective ethological and genetical isolation, resulting in speciation of morphologically very similar populations. Some 250 Hilara species have been described in the Palaearctic region until now, of these about 200 species are known only in Europe, the undoubtedly best-investigated region. However, even in Europe many species remain still unrecognised, awaiting description. The northern European fauna was fully studied in 2005 (Fauna entomologica scandinavica, vol. 40), with 90 well-recognised species. The present monograph covers the Mediterranean region from the Canary Islands to the eastern shore of the Mediterranean, and it includes altogether 82 Hilara species, in a generally very different fauna to that of cold and temperate Europe. In all, 31 species are described as new to science in the Mediterranean region, classified into 13 natural groups of species characteristic to western Palaearctic fauna. 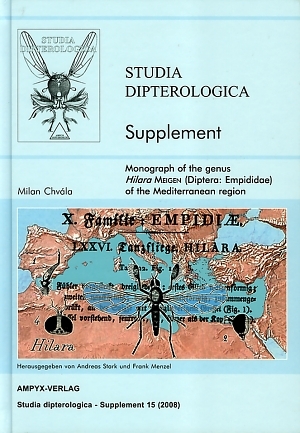 The species of the genus Hilara Meigen (Diptera: Empididae) of the Mediterranean region are revised. In all, 82 species classified into 13 natural groups of species are treated, of these 31 species are described as new for science: H. cypriana spec. nov. and H. autumnalis spec. nov. of the H. abdominalis-group, H. balearica spec. nov. and H. clavidipes spec. nov. of the H. clavipes-group, H. aptoides spec. nov., H. spectabilis spec. nov. and H. tabarkensis spec. nov. of the H. canescens-group, H. antalyensis spec. nov., H. neolitorea spec. nov., H. spiniplatyura spec. nov. and H. moceki spec. nov. of the H. litorea-group, H. embartaki spec. nov. of the H. intermedia-group, H. barbata spec. nov., H. pygialis spec. nov., H. royi spec. nov., H. rostrata spec. nov., H. adriatica spec. nov., H. bernmerzi spec. nov. and H. mantovensis spec. nov. of the H. cornicula-group, H. orilasiochira spec. nov. and H. danielssoni spec. nov. of the H. lasiochira-group, H. schachti spec. nov., H. israelica spec. nov., H. turcica spec. nov., H. mediterranea spec. nov. and H. freidbergi spec. nov. of the H. interstincta-group, H. corsicana spec. nov. of the H. borealis-group, H. amnoni spec. nov. and H. andreasi spec. nov. of the H. chorica-group, H. alboclypeata spec. nov. of the H. maura-group, and H. theodori spec. nov. of the H. albitarsis-group. Further 23 species, previously described from the Mediterranean are fully redescribed and the main differential features are illustrated. Five lectotype designations are presented, and 3 new synonyms: Hilara griseifrons Collin, 1927 is a new synonym of H. ternovensis Strobl, 1898, Hilara subpollinosa Collin, 1927 is a new synonym of H. pseudocornicula Strobl, 1909, and Hilara lundbecki Frey, 1913 becomes a new synonym of H. cantabrica Strobl, 1899. Die Arten der Gattung Hilara Meigen (Diptera: Empididae) der Mittelmeerregion werden revidiert. Insgesamt werden 82 Arten, die sich 13 natürlichen Artengruppen zuordnen lassen, behandelt. Von diesen sind 31 Spezies neu für die Wissenschaft: H. cypriana spec. nov. und H. autumnalis spec. nov. (H. abdominalis-Gruppe), H. balearica spec. nov. und H. clavidipes spec. nov. (H. clavipes-Gruppe), H. aptoides spec. nov., H. spectabilis spec. nov. und H. tabarkensis spec. nov. (H. canescens-Gruppe), H. antalyensis spec. nov., H. neolitorea spec. nov., H. spiniplatyura spec. nov. und H. moceki spec. nov. (H. litorea-Gruppe), H. embartaki spec. nov. (H. intermedia-Gruppe), H. barbata spec. nov., H. pygialis spec. nov., H. royi spec. nov., H. rostrata spec. nov., H. adriatica spec. nov., H. bernmerzi spec. nov. und H. mantovensis spec. nov. (H. cornicula-group), H. orilasiochira spec. nov. und H. danielssoni spec. nov. (H. lasiochira-group), H. schachti spec. nov., H. israelica spec. nov., H. turcica spec. nov., H. mediterranea spec. nov. und H. freidbergi spec. nov. (H. interstincta-Gruppe), H. corsicana spec. nov. (H. borealis-Gruppe), H. amnoni spec. nov. und H. andreasi spec. nov. (H. chorica-Gruppe), H. alboclypeata spec. nov. (H. maura-Gruppe) und H. theodori spec. nov. (H. albitarsis-Gruppe). Weitere 23 bereits bekannte mediterrane Arten werden detailliert nachbeschrieben und die wichtigsten Merkmale zu ihrer Unterscheidung abgebildet. Fünf Lectotypen werden festgelegt und 3 neue Synonyme erkannt: Hilara griseifrons Collin, 1927 ist neues Synonym von H. ternovensis Strobl, 1898, Hilara subpollinosa Collin, 1927 ist neues Synonym von H. pseudocornicula Strobl, 1909 und Hilara lundbecki Frey, 1913 ist neues Synonym von H. cantabrica Strobl, 1899.